July 27, 2014 -- As a professional musician for 30 years and former public school orchestra teacher, Matthew Schneider loves the diversity of music styles that he gets to play, from rock to jazz to classical and country. Now the 26 elementary school kids enrolled in Schneider’s SummerStrings! Junior Orchestra will appreciate that variety too. ﻿READ MORE . .
On Sunday, August 3, The Sounds of Society will pay tribute to the band Chicago at Morgan Park Summer Music Festival. The concert, which is free to the public, begins at 7:30 p.m. in Morgan Park. READ MORE . . .
July 29, 2014 -- In the image to the left, an effigy of St. Rocco, the protector against plague and contagious diseases, is brought up 3rd Street in Glen Cove on the culminating day of last year's St. Rocco's Feast. As the three hour procession makes its way through the neighborhood, devotees sing songs, recite prayers, attach monetary offerings to the statue, and visit the homes of the sick and infirm where the Pastor of St. Rocco's Church offers blessings with a relic of the Saint. The procession, the central event of the six day Feast of St. Rocco, will take place following Mass on Sunday, August 3. The festival begins the evening of Tuesday, July 29, and concludes Sunday night. Click here for more information about St. Rocco from St. Rocco Society of Potenza. 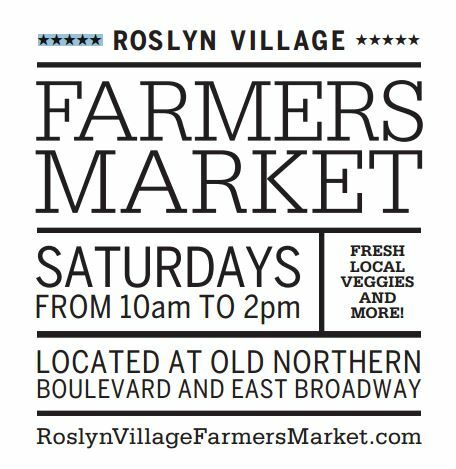 The Village of Roslyn is proud to announce the opening day of its brand new Farmers Market carrying local and organic goods from New York. On August 2nd, 2014, from 10-2, and every Saturday thereafter, the weekly farmers market will be held at the location where Old Northern Blvd intersects with East Broadway (formerly the site of the old Exxon station). July 25, 2014 -- With the scenic venue and a spectacular summer sunset perfectly complementing their performance, the Rusty String Band played an energetic set of bluegrass, folk-rock, and blues before an audience of hundreds at Sea Cliff's Memorial Park on Thursday night. 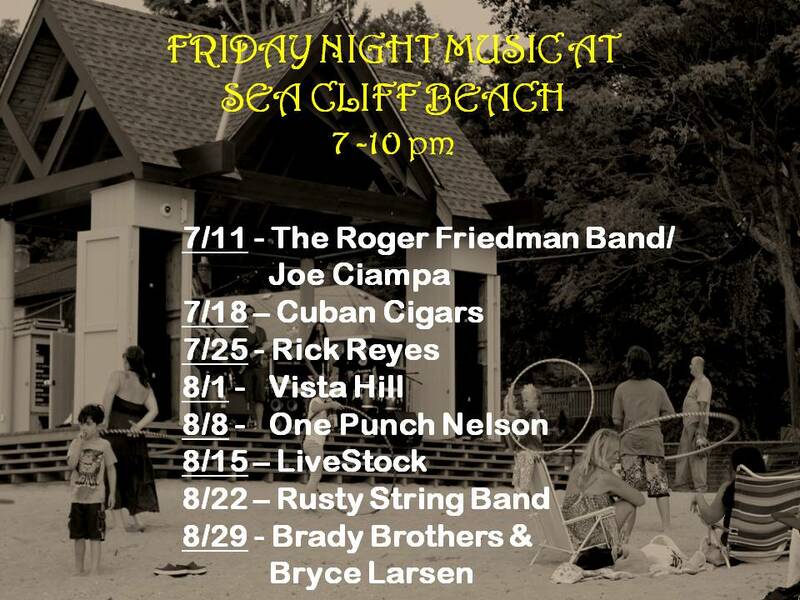 The following evening, Electric Jam entertained with some classic rock down at the Sea Cliff Beach permanent performance pavilion. 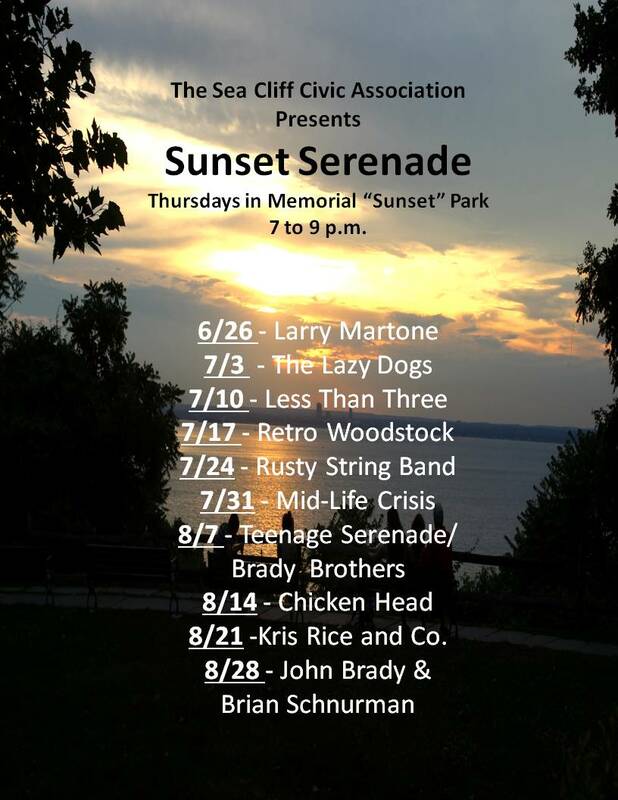 This Thursday, the Civic Association's Sunset Serenade will feature Mid-life Crisis from 7 to 9 pm, and on Friday Vista Hill will perform at the beach starting at 7 pm. Looking for a Peruvian restaurant that's nearby, need to contact your county legislator, or just wondering who's playing at local bars this weekend? Check out Northwordnews' Community Directory, Restaurant Guide, and Events Calendar pages. Explore them at the links to the left. 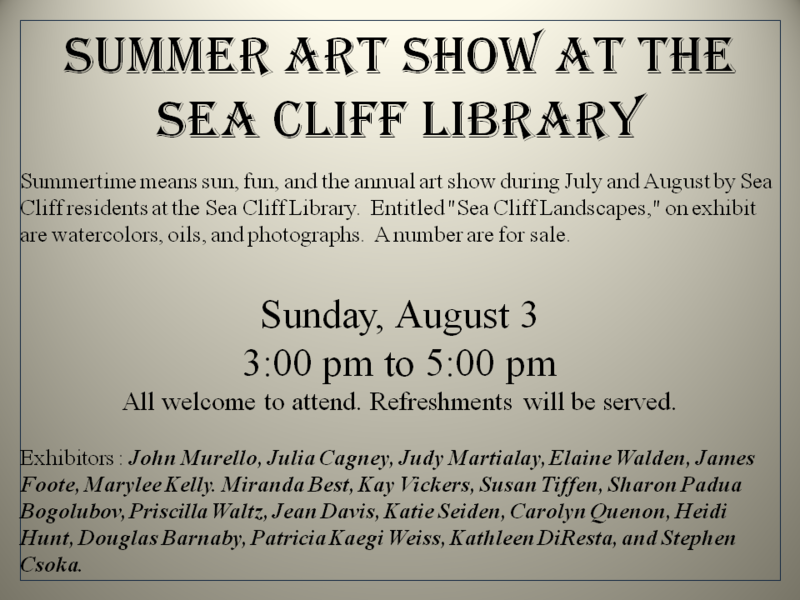 July 29, 2014 -- In an effort to promote civic education by offering young people an opportunity to experience democracy first hand, the Sea Cliff Village Trustees and Mayor Bruce Kennedy are encouraging parents to bring their children to the August 11 Village Board meeting. "We hope this experience of observing village residents and their elected officials interact at a Board of Trustees meeting will be both educational and rewarding to all parties concerned," said Trustee Edward Lieberman. Children, escorted by a parent, are encouraged to ask questions during the public comment portion of the meeting. 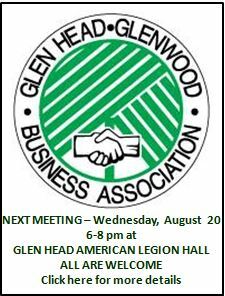 The meeting will begin at 7 pm. 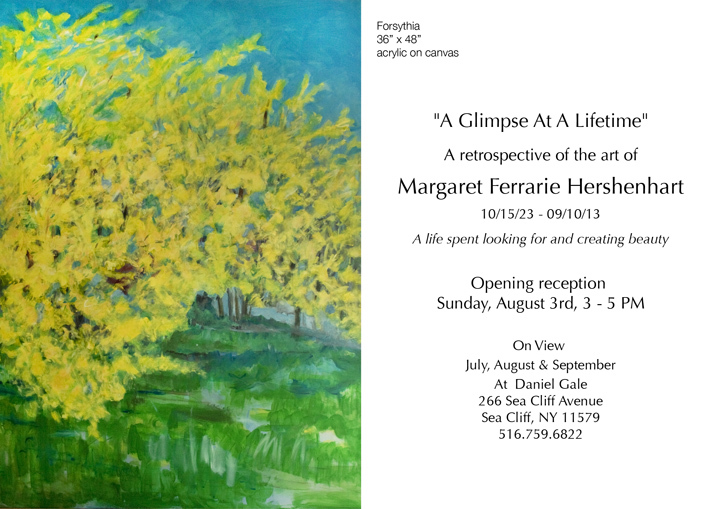 The works in this memorial retrospective exhibition are examples of a much broader body of Hershenhart’s life’s work. She had an affinity with the European artists, particularly the French painters, Henri Matisse, Toulouse-Lautrec, and Marie Laurencin to name a few. 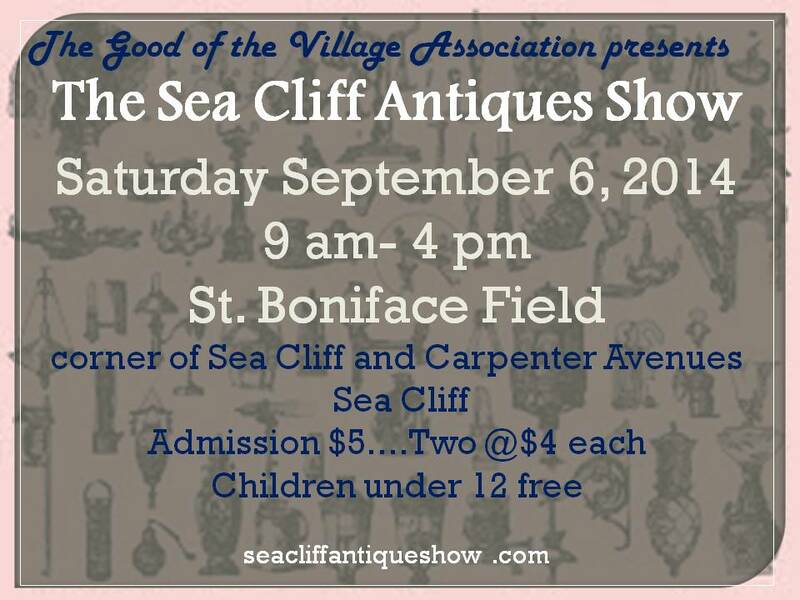 On Saturday, September 6, the Sea Cliff Good of the Village Association will be holding its annual Art and Antiques Show at St. Boniface Field from 9am to 4pm. For sale will be a wide assortment of antique and collectible furniture, jewelry, paintings, prints, vintage porcelain, glass and sterling, as well as rugs and art. A few spots are still available for vendors. If interested, call 516 671 8399. Admission $5....Two @$4 each.... and children under 12 free. 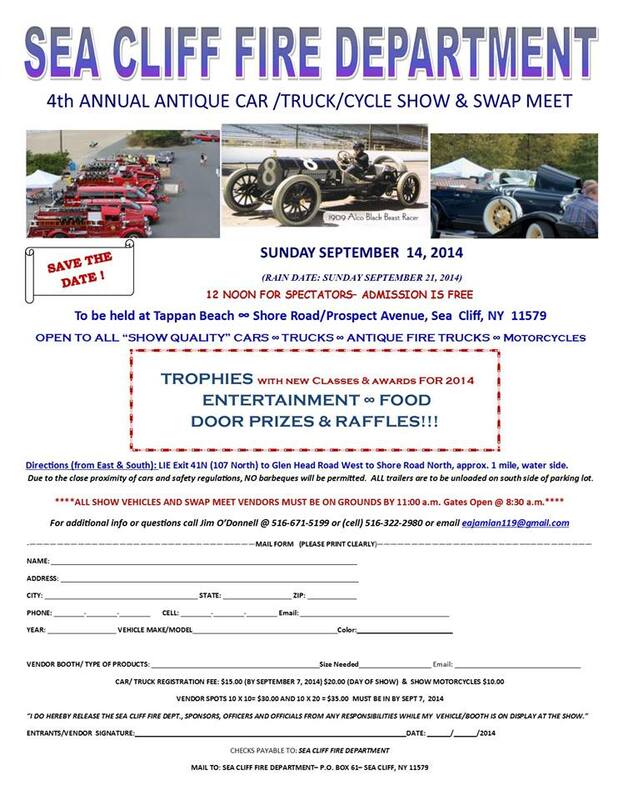 The Sea Cliff Fire Department will be hosting its fourth annual Antique Car/Truck/Cycle Show and Swap Meet at Tappen Beach on September 14th. The registration fee for cars and trucks is $15 in advance and $20 the day of the show; for show cycles it is $10. The registration and payment deadline for vendors wishing to have a 10x10 booth ($30) or a 10x20 booth ($40) is September 7th. Click on the image to the left for the registration form.